DCU Mercy would like to start by saying a huge thank you to everyone for their help and support throughout the season especially our team managers who volunteer and organise referees, table officials and much more. To all the club members who did the table at games and to our coaches who give their time voluntarily. To our sponsors, particularly DCU, the Committee and of course, to the parents whose support is always there, and lastly the players for their dedication, commitment and efforts throughout the season. Thank you to all who made sandwiches etc. at our various events throughout the season. To those who baked and helped at the cake sale. For donations to the charity bag collections, for buying raffle tickets etc. A particular thank you to Paul and Sharon Hennessy who organised this year’s new event “the 75km cycle”, it was a great success and a fun day was had by all involved. Hopefully, we can build on it and have more cyclists next year. The 2016-2017 season was another very successful season. We had 9 players selected for Irish panels and 3 players selected for Dublin teams. Damien Sealy was awarded Women’s underage “Coach of the Year”. Mark Ingle who received Basketball Ireland Coach of the Month for December. Sarah Fairbanks was awarded Superleague Player of the Month for October and December. The senior team, the under 18 and under 17 girls won the Dublin Cups. The under 20’s and under 18’s won the National Cup titles with Nicole Clancy and Bronagh Power-Cassidy receiving MVP of the respective cup finals. The under 18’s won the Laura Brennan Memorial Tournament. Sarah Fairbanks was awarded the Basketball Ireland’s Women’s Superleague first team All-Star Award and Sarah Woods was awarded Basketball Ireland Women’s Superleague second team All Star Award. 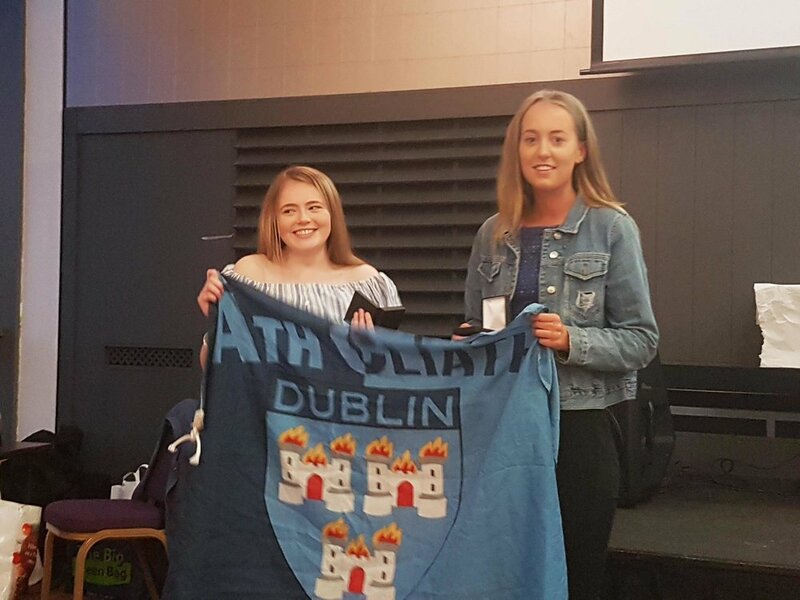 As we are so closely linked with DCU College and some of our players play on the college team also, we would like to congratulate Megan Connolly and Sarah Fairbanks who received College All Star awards and to Sarah Fairbanks who was MVP of the College Varsities and who received College Player of the Year. We would like to congratulate Saoirse Power-Cassidy who left us last year to play in America and who signed a 4 year scholarship with University of Massachusetts Lowell. So as you can see a very successful season overall. Under 17 team and Coach Damien Sealy, players Elizabeth Black, Niamh Hickey, Rebecca Dodd, Ciara Owens, Laura Owens, Aisling Byrne, Jane McHugh, Kim Clarke Bronagh Power Cassidy, Maeve O’Séaghdha, Ali Donohoe, Katie Nolan, Nicole Clancy and Fiona O’Grady. Under 13 team and Coach Stephen Ingle, players Rachel Sealy, Ali Sealy, Mia Challoner, Alison Grealy, Lynn Grealy, Claire Canning, Orlaith Monaghan, Brook Farrell, Kate Hennessy, Amie Curley, Alex Nolan, Jewel Wenzel and Holly Stanley. To all our other teams congratulations on your achievements and league placements.